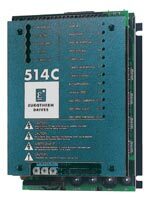 The regenerative 514C DC drive offers full four-quadrant control of dc motors from single-phase supplies. As such it is ideal for applications involving overhauling loads or where rapid and accurate deceleration is required. Together with the non-regenerative 512C, they offer the perfect solution for lower power single motor and multi-drive applications. The 514C series meets European and North American standards when installed in accordance with relevant product manual.